President Barack Obama and First Lady Michelle Obama. Dakota Fanning. Steve Buscemi. Timothy Hutton. Dr. Oz. Alicia Silverstone. I take it you've heard of these people? 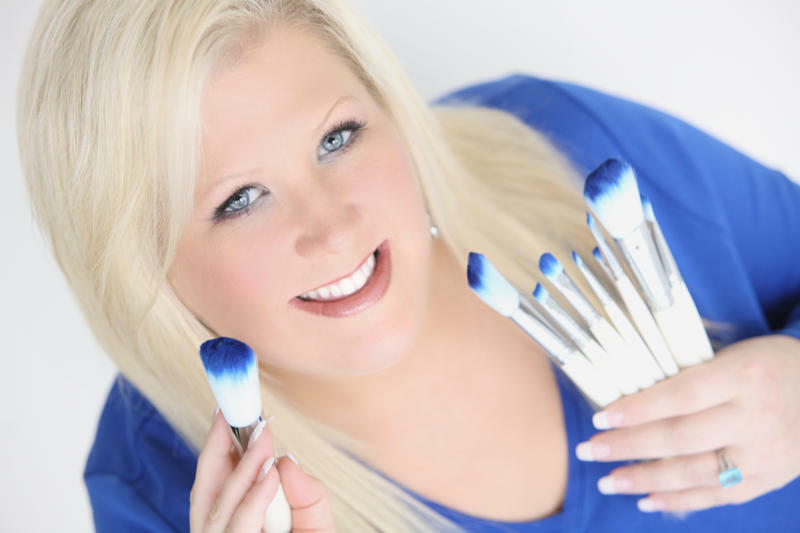 Well, makeup artist and hairstylist M'chel Bauxal has worked with all of the above, and many more over the years! Read on to find out how she first got involved in the industry, her tip to make the whites of your eyes bigger and so much more! I'm originally from Oregon. At 18, I ventured to L.A.'s American College of the Applied Arts, then transferred to the Fashion Institute of Design and Merchandising where I graduated with a B.A. in Fashion Design in 1996. While working with the special effects makeup team for Six Flags Magic Mountain Fright Fest, I developed a passion for makeup and pursued it full time after graduation. Acquired every book that would increase my knowledge in makeup artistry and taught myself all the basics about beauty, airbrushing, special effects and hair designing. I then utilized my fashion and glamour knowledge to market myself in the entertainment industry. I moved back to Oregon in 2004 after 11 years in L.A. and currently enjoy appearing in a semi-monthly makeup segment on the ABC affiliate KATU Channel 2 program out of Portland called AM Northwest, where I help educate viewers on current makeup trends. I am currently a beauty expert writer for two online magazines called BestEverYou.com and BestOfYouToday.com. How did you first become interested in beauty, and what led you to become a makeup artist and hairstylist? I had been interested in glamour and beauty as a young child, watching beautiful women on TV and then creating my own designs using "Fashion Plates" that were sold in stores sometime in the early 80's. I created more unique and complicated designs as I got older and even built clothing for my younger sister Allison to have my ideas come to life. In 1994, I began to work at Magic Mountain doing their costumes for various shows and seasonal events. While working on Fright Fest in 1995 (October), I was asked to do the makeup and hair for actors/characters. Off season, I started to do hair and makeup for films and television programs and still did some costuming (like the Jenny McCarthy show). From then on I pursued makeup and hair as it was more my passion. You have a very impressive celebrity clientele -- everyone from President Obama to Dakota Fanning and Selma Blair! What are some of your favorite moments? Getting the call to work with the Obamas boosted my career. Getting the two page spread in the July/August issue 2010 Hair's How, where I was called The Max Factor of the Great Northwest, that made me feel accomplished. The times I have been able to do my own segments on the ABC affiliate KATU channel 2. Being a makeup artist is usually behind the scenes so some of my favorite moments also include times that productions choose to use footage of me doing my work. What are your top beauty essentials? 1) By placing a white pencil liner on the inside waterline of the eye, you will make the eye appear larger and the whites of your eyes whiter. 2) Using a black waterproof gel or pencil liner on the top inside waterline of the eye you will make the roots of your lashes look thicker, thus appearing to show more shape to the eye. 3) If you use concealer or foundation on your lips, then your lip color will last longer. And how about your top 3 hair tips? 1) To protect your hair from heat damage from the blow dryer or flat iron, use a thermal protectant spray. 2) To get that beautiful 1940's wave, use a 1" curling iron or rollers vertically on your whole head layer by layer first. Then continue by brushing out with a boar and nylon mixed bristle brush like a Mason Pearson. 3) Use a hair mask at least once a week for split, dry, oily hair. Being a makeup artist and hairstylist must be fun -- but what do you do in your spare time? My husband and I volunteer, attend industry related get togethers and parties, I help my husband with his TV projects and work with my stepson to develop his music talent. I try to spend time on my clothing line (Swarovski crystal accented apparel) including filling an order right now being shipped to London for Makeup Artist Magazine.